I'm working like crazy trying to get finishing touches on Tis Hallowe'en ....ALMOST THERE! I think you will really like this one. Even I'm excited!!! So ...not much writing on the blog today. My husband and I picked three gallons of blackberries this morning and now I'm back to work on the computer. I tell you...if you want to give that special someone a gift, give them a blackberry bush. It's the gift that keeps on giving....and giving....and giving. I bet we have picked at least 30 gallons of berries. Whew! That's a lot of blackberry pie and jelly. I feel my hips expanding just thinking about all that sweetness. This carry-all is from our Beach House line with Moda fabrics. The image on front is cross stitched by machine. Just right to carry all of your summer projects. I wish we had more of these...but there's only one. So we will draw three second place winners....I have several more of these and would like to give them to you. So, ladies and gents....leave your names in the comment section and I will draw a name Saturday night. Good luck to you all! I am working on your "Of Thee I Wed" and four other house designs. I love them. A carry all would be wonderful. Very nice! I'd like to be entered please! I just discovered your blog recently even though I have long been a plan of your patterns. Thank you for the continued inspiration! I love the high school pictures you put the other day, b & w picture used to have a nice quality! Please include me in your contest! Love your designs! I am excited about your Halloween booklet too - can't wait! You have the most generous giveaways. Please enter my name! Oh please include me in your contest. The tote and the scissor bag both look great and I've been searching high and low for a nice tote. Mmmmm....blackberries sure sound good right about now! Oh, so pretty! Please enter me in the drawing. Thanks so much for all of your lovely designs and inspiration! We love blackberries! I don't think they grow very well in Florida though. Nice giveaway - thank you! Looking forward to seeing your Halloween design! Oh my goodness, another draw? Please do enter me in. Mmmm...blackberries. You are going to love opening your freezer and finding them there throughout the long winter! I'd love to be entered in your giveaway. 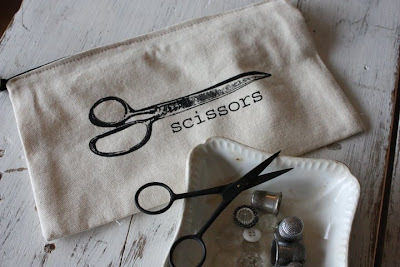 Those little scissor pouches are so cute - and useful! YAY! Another contest! I love you guys! Currently stitching "Spring Fling" and loving every minute of it...almost done and then will send you a pic! I love all your designs, quilt and cross stitch. I have many of your books and patterns. You are wonderful designers. Please enter me in your drawing for the bag. Would love to have it! Both are great. Please enter me please!! Thank you for a contest again! Blackberries are a favorite of my husband! Yummy! What a great giveaway! I'm going to keep my fingers crossed for this one! Oh, Alma you offer the best giveaways! I don't know which I am more excited about. The bag is just beautiful - I love the soft muted colors and how perfect for toting my stitching around - much better than my oversized ziplock baggies - I would even look fashionable, friends would be shocked. They always see me with a plastic bag in my hand and are so gracious not to comment. Of course, the little scissor bags are such a darling idea and how exciting to have another chance at them as well. p.s. we are all anxiously awaiting your halloween stockings. Please enter me! BTW I love the new Halloween quilt! How do you do it? You know I'll have to have this pattern as well. Can't wait to buy it! Very cute. Who can't use another carryall. Thank you for the opportunity to win this one. Please add my name to the drawing. that bag is adorable, like all of your wonderful projects. Oh please enter me! I am a tote-a-holic! And I love the scissors bags- too cute! Thanks! Such a sweet tote! I would love to be a winner! Thanks for another chance to win. Though I am not a fan of Halloween in general, I really like your Halloween quilt. Very Nice! Please enter me in your contest. Can't wait for the halloween book! thanks! It's beautiful - just like everything you do. Please enter my name! Love your blog, your patterns, and your fabric! I can't believe all you get done, it's amazing. Love all you do and thanks for sharing. Please enter me in your drawing. What a beautiful bag! I love your blog and patterns. What a darling bag. Thanks for being so generous! hi! i am currently working on my version of the 'birds of a feather' quilt, and i love your patterns. I would love to win the carry all. Love all your desings. I can't wait for Tis Hallowe'en. I just finished the stork stocking--so easy. Please include me in your drawing. Thanks for offering another one of your wonderful give aways,please include me in the drawing. Lovely!!! I would LOVE to be entered in your draw! I love bags of all sorts, please enter me in the drawing! P.S. I can hardly wait for the new designs, I have everybody in office excited as well! What a nice drawing - throw me in please. Beautiful! I love all your designs. Wonderful giveaway!! And just wanted to say I can't wait to buy your new Halloween pattern!! What a lovely gift - please enter me in your giveaway. I love blackberries - my mum makes fab bramble jelly, my dad picks the berries on his daily walk, I think he thinks it's fab too! Oh, my....another awesome give-away!! You're just like those blackberry bushes, just keeps on giving!! I'd love you blog even without the awesome gifts....I'm working on my Flea Market Find sampler and really would love to carry it around in that beautiful tote--everyone would be shocked to see me without that brown lunch bag, ha!! Thanks for everything!!! What a lovely bag to hold all my Blackbird Designs WIPs! Please enter me in your draw. Thank you. You are so generous with your contests, Alma! Thanks -- I know I won't win, but at least I get to see the prizes! lol! Thanks a lot for this new giveaway! This bag is beautiful, the colors are so sweet... Please, add my name to the draw. What a darling bag! And how lucky you are to have so many blackberries. I just love them, but we're not in the right "growing zone". Pie sounds fabulous right about now! Can't wait to see the new Halloween Stocking Book!! Of course I would love to have this one!!! Of course, I would love to have this one!! Toss my name in! Thanks for the chance! That bag is so beautiful. Thank you. I'm envious of your blackberry bushes!!! I would love to be entered in your wonderful drawing - it's really a generous give-away! Thank you!!!! That Beach House bag is beautiful and I love the scissors bags too. I love your blog. Please enter me in your contest! So, besides spoiling us with your blog and projects, you continue to spoil us with your contest. LIFE IS GOOD!! Thanks Alma. Love all your designs - fabric, quilts, cross stitch. It doesn't get any better than this. Oh yes, please put me in the drawing! Thank you so much. looking forward to seeing the halloween designs and i hope i win a prize! I'd like to be entered, please! The blackberries are just starting to ripen here in the Northwest thanks to all the recent warm weather. I've got to get out and pick some this year. I love the Beach House tote. Please enter me in your latest drawing. I love your new Halloween quilt and can't wait to get the pattern. Can't wait to see the rest of those Halloween stockings! I have already gotten a black tree lined up for them and hope to get alot of them done this year to display. Love all of your designs! Please put my name into the hat for your wonderful give away! Please add me to the giveaway list as that tote is adorable and you can never have to many totes. Please enter me in your drawing - that tote bag is really cute! And who doesn't need just one more tote?? I love your designs, just can't get enough! Please enter my name in the drawing. Thanks! I am picking blackberries, too, for shortcake. I'd love to win a prize. I love ALL your patterns, quilting and cross-stitch!! Your books are fabulous and your blog is GRREAT! WOW what a lovely carry-all.Please,please enter me in your giveaway :) Barb. I am waiting on your Halloween Stockings Booklet, can't wait to start stitching them. And I love your Tis Halloween Quilt Book too. Blackberries are delicious, they would be good in your muffins. I would love to be entered, thank you for sharing. Look forward to your new patterns. Love all your designs and would love also to be entered in the draw! Thanks. Would love to be in your drawing, just love that bag, can't wait for the Halloween stockings. Thanx for the chance to win. Oh to live in that little house!! A carry all would be wonderful to put my project in to carry with me. I am going to be taking mom to alot of radiation treatments.. I love your designs!!!! What a cute carry-all! Love your designs! Looks so great! The winners will be very lucky! I would love to be included in your drawing. The bag is fabulous but so are the scissor bags. Love them both. Thanks for the opportunity to win such beautiful things! can't wait to see your new booklet about halloween. Please, count me on this new contest : I love most the scissors bag. thank you to be so generous. Thank you so much for this opportunity! I would love to win the carry all, or anything, lol! Oh, how cool!! Thank you for the chance! Can't wait til the Halloween things are out! I'd love to win a bag! Thanks for your great designs. 30 gallons...just this year?? ?OMGoodness my husband just ordered 6 plants!! Love the bags! Beautiful! I would love either prize. Please enter me in your drawing. Wow 108 comments. I hope to make a change. Mmmm Blackberries. I use to go picking with my grandpa. Always a fun time. I would love to enter for that sweet bag. I have 3 BBD I am working on and what better way to tote them along wherever I go. Great giveaway! I love blackberries. Someone will very lucky to win these items. Love your blog and your patterns and books and own many. I have my "quilting the garden" quilt in progress. So beautiful. The quality of your books is amazing. I wish I could buy them all! Oh, that bag is so cute...please enter me in your drawing. I'd love to win one of the featured items. Thank you Alma. I would love to win one of these. stockings - lovely, portable & quick. Please enter me in the drawing & congratulations to the winners! Yes !!! I love them too !!! how exciting is it ! Cute bag, would love to add it to my tote collection. I'm a big fan of your patterns, and I really enjoy your blog. Please enter me in your drawing!!! How sweet and kind of you. Thank you. Love to own a scissors case. Thank you for the opportunity again. A gorgeous bag and more scissor bags too! Please enter me into the draw. I Love your giveaway.Ellen W.
Can't wait to see the new new "Tis Halloween"!!! Blackberries are so wonderful, I'm jealous you have such an abundant crop! Mmmmmmm!! Love the bag, thanks for offering yet another great giveaway! I love your designs!!! Love reading your blog too. I'm working on the From me to Thee cross stitch. I love it. I made one last year for me. Making one this year for a friend for Christmas. The bag would be great to put my things in. Hi from Spain I love blackberries and your giveaways.Happy summer!! What a great giveaway!!! Thanks for the chance. I can't wait to see the new Halloween stockings!!! Love the Beach House line. Please enter me in your drawing. I am so excited about your Halloween booklet - I can't wait anymore ! Alma - please enter me in the drawing for the bag. Wish I had a pint or two of the blackberries - they are not that readily available in NE FL. Oh my what a wonderful prize. Please add my name to the drawing. and I have to say I love the new book. I just can't wait until you put it out. Your work is just exciting! How exciting. I love contests. I am keeping my fingers crossed on this one. I would love a new carry all. One can never have too many. I love your blog--beautiful photos also! I'm very impatiently waiting to see tis Halloween. I can't wait until it's available. Please enter me in your drawing. We have wild blackberries growing along our property - I really like blackberry cobbler! I am anxiously awaiting Tis Halloween and would love to be entered in your drawing. I'm becoming addicted to Halloween designs - and we don't celebrate that holiday in Australia - people are looking at me funny - well funnier than normal! Thank you for the chance to enter another of your lovely competitions. Please do enter my name, I would be truly blessed to win either of these special gifts! Thanks for having such a generous and giving heart! Hi I would love to have that carry all. I have really been into making purses and bags lately but I keep giving them all away. I am working on your 'Merry Christmas Ella Vaughn' cross stitch pattern! I am doing all of the "Remember Me" series plus I am making the cute little baskets and your 'Back to School' pillow case! I love all your work and I love blackberries too!!!! My but your drawing is popular. I would love to give your Beach House tote a nice home. A scissor pocket would find an appreciative home here. it looks SO CUTE!!! i hope i win this one!!! i'd love to have something that i could carry around and brag about! The carry all is lovely and I would love to win. Thank you for being so generous! You are such creative ladies! Hello from Spain.Would you enter my name in please? I love your designs. Cute bag. I love the Beach House line! Working on a quilt with it now. Can't wait for Old Primrose Inn. Thanks for the chance to win such lovely things, Alma! Ha ha - lots of competition here. But I'll leave my name just as well... :-) Thank you Ladies for your kindness ! Oooh, yes please! What gorgeous prizes, thanks for the competition! The Carryall looks wonderful. Love your work. Pls include me in your contest. I am just flipping through your Sarah Tobias book, picking a project. I can't wait till your Halloween designs come out! It can't hurt to try to win. Maybe I'll get lucky! Either gift would be lovely, but the carry-all would be so wonderful after my search to find the jelly rolls for the quilt pattern. There must have been a rush, but I finally was able to order them from an online shop. I'm having such fun cutting and making the half triangle squares. So excited about the Halloween patterns that I cannot STAND it! Keeping my fingers crossed for a win! I would love to be entered in your contest. I just stumbled across your blog today but have loved your patterns forever and have made several of your quilts and cross stitch designs. I have a recipe for a raspberry buttermilk cake that I have made with blackberries instead and thought you might enjoy that. Preheat oven to 400 degrees. Grease and flour a 9" round cake pan or pie tin. Combine flour, baking powder, baking soda, and salt. Set aside. In a larger bowl, beat together butter and 2/3 cup sugar with electric mixer at medium high speed until pale and fluffy (about two minutes). Beat in vanilla and zest. Add egg and beat well. On low speed, add flour mixture alternately with buttermilk in three batches. Mix just until combined. Spoon batter into prepared pan. (I push the batter away from the middle to the outer edges as sometimes this helps to even out the top as it bakes.) Scatter berries evenly over the top and sprinkle with granulated (or raw, which gives it a little "sparkle" on top) sugar. Bake until golden brown and set. A toothpick inserted halfway into the center should come out clean. This takes anywhere from 25-35 minutes depending on your oven. Watch it carefully as it burns easily. Cool in pan about 10 minutes. Then turn out onto a rack to cool about 10-15 minutes more. Invert right side up onto a plate. At this point, I decided to add a simple powdered sugar glaze and drizzle it over the cake. I used 2/3 cup powdered sugar and added lemon juice until it was the consistency I wanted. It melted slightly into the cake, giving it a nice finishing touch and a sweet glaze. You can serve it plain, with whipped cream and additional berries, or even with ice cream. When you cut it, you will notice the berries have sunk to the bottom, which is normal and very pretty. You can cut the cake into wedges and arrange them on a serving plate. They are very easy to pick up and eat without a fork. Love your blog. Can't wait for your new book. I am in love with the scissors bags! So cute!! Please include me in the draw Alma. I'll have some pie too. Oh my goodness, I'm excited to find this blog. I've enjoyed your books and projects for many years and am excited about the new ones coming out. Thanks for your hard work. I'ld like to be entered for a chance to be a winner in your drawing! Thank you for another contest! Hi Alma, I'd love some of those blackberries ..yummo! thank you for your inspiration and dedication! I'm excited to find this blog. I've enjoyed Blackbird Designs for many years and always look forward to the new patterns. How very exciting it would be to have my name drawn as a winner of either prize! Thanks for your hard work and the fun you provide for us. Love that bag! Please enter my name in the giveaway. Thanks for another great giveaway- please enter me. Hmmmm, blackberry jam. I just made some yesterday, got the berries from a local farmer. 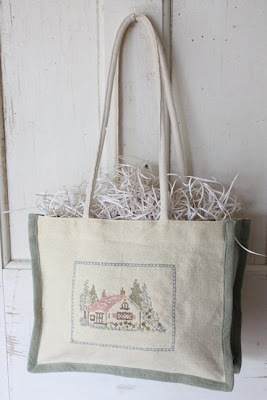 The bag is beautiful,and love the cottage design, is it a set of machine embroidery designs? What a lovely giveaway! Thank you for the chance to enter your contest! I'm crossing my fingers to win one of those scissors bags! As if it's not enough that you share your talent with us in creating such lovely patterns. Your generousity continues with fun reading and wonderful give-aways. LOVE LOVE LOVE your designs! Blackbird Designs has been a favorite of mine for many years...Thanks for the wonderful inspiration!